The history of the university’s music education and training of instructors dates back to the founding of the Ongaku Torishirabegakari (Music Investigation Committee) in 1879. The Tokyo Music School, which succeeded Ongaku Torishirabegakari, featured a teaching department in addition to departments focused on musical training and development. Since the school became Tokyo Geijutsu Daigaku, no music education department has been offered at the undergraduate level. The current master’s degree program was established in 1969; the doctoral program was established in 1977. The musical education program trains scholars and practitioners capable of examining the various interactions between human beings and music from a teaching perspective. The subjects of such study are diverse, going beyond conventional school education to professional music education, children’s music education, music education for children with disabilities, and music education as social education and lifelong learning. Since its establishment, the program has graduated numerous highly-trained individuals noted for their humanistic outlook. Master: Since the establishment of the music education chair in 1969 as a Master’s Program, the aim has been to nurture researchers and practitioners who can consistently foster compatibility between both the specialized field (music) and the field of music education. To achieve this, the following curriculum has been organized to develop the required knowledge and techniques. The goal of research in the field of music education is to foster the pursuit of diverse connections between humans and music from an educational perspective that is not limited to music education as a part of school education. It goes beyond and covers a broad range of aspects such as specialized education in music, music education for children, music education for disabled children, social education, and lifelong learning. The curriculum is designed to respond to the needs of the students as much as possible, and within the limited framework of the seminar, the curriculum enables students to approach music education from a broad range of perspectives. In addition to writing the research thesis, the unique features of the curriculum include the study of specialized practical techniques and the promotion of research activities closely related to the practical experience through research, study classes, and lessons. Doctor: Since the establishment of the doctoral program in 1977, the aim has been to nurture researchers in music education. To achieve this, the educational curriculum has been organized to develop the required competence. While further expanding and developing the research initiated during the Master’s Program, the curriculum enables students to pursue research that is based on their individual themes and acquire the knowledge and techniques to become high-level professionals. Practical learning is emphasized with the objective of creating a dissertation, but the content of the specialized doctoral research and practical learning is based on the needs of the students and contemporary issues. The curriculum is designed to support students in their presentation in the university and beyond. Master: The Master’s degree is awarded once the students have been enrolled for the period stipulated by the concerned department, have obtained more than the basic number of credits, have passed the Master’s thesis review and the examination related to music education, as well as the practical examination for musical instruments (excluding students from the Department of Musicology), and have completed the course. The Master’s Program requires students to acquire advanced techniques related to the specialization of music and a broad range of knowledge related to music education, including outstanding abilities to conduct research and practice in music education. Doctor: The doctoral degree is awarded once the students have been enrolled for the period stipulated by the concerned department, have obtained more than the basic number of credits, have passed the doctoral dissertation review and examination related to music education within the stipulated period, and have completed the course. In the doctoral program, students are required to be active as independent researchers, and acquire the essential abilities and fundamental knowledge needed to engage in professional practices as advanced professionals. Master: The curriculum includes solfege and solfege education, with the intent to view them from the perspective of the assimilation and acceptance of Western music in Japan. To research the theoretical and practical methodology related to these aspects from a multifaceted perspective, the program provides guidance for conducting research and writing the thesis based on the system of guidance from several faculty members. Furthermore, guidance for practical techniques in the respective specialized fields of study is conducted to enable research on solfege as basic education. Doctor: Considering the abilities diligently acquired in the specialized areas studied on the Master’s level, the doctoral course provides a research and guidance program for writing a dissertation that aims to develop musicians with research skills, and solfege researchers and educators who have acquired advanced musical specialization. The educational and research structure consists of two full-time instructors, with one educator serving concurrently in another position; four part-time instructors; and three training and research assistants. 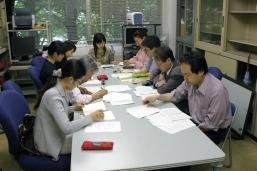 Educational and research activities take place at both the Ueno and the Senju campuses. This program focuses on research based on each student’s area of interest, as well as familiarizing each student with basic knowledge and skills in music education methods and topics. The primary characteristics of the program include students being required to develop advanced musical skills in addition to preparing research papers, and education and research being conducted through classroom study, in close cooperation with teachers. In this program, students pursue research based on an independently selected theme, building on previous work in the master’s degree program. They also gain familiarity with the specialized knowledge and skills needed to function effectively as professionals in the field. The program has welcomed graduate students from the United States, China, South Korea, Brazil, and other nations. A number of these graduates are currently active as music education researchers and practitioners in Japan and in their home countries. Most graduates are active in music training and scholarship; as instructors at universities or faculties of education, music universities, and other post-secondary institutions; or as instructors at various elementary schools, middle schools, high schools, and special needs schools. Others are working as composers, performers, and dancers. The university in 1971 became the first in Japan to establish a solfege program in this area of instruction. Although the term solfege is said to have been introduced to Japan during the Taisho Era, which lasted from 1912 through 1926, the program started from almost nothing. Today, solfege is considered to be the foundation for all general musical education and is required for all students of music. Each year, some 600 students take courses in the subject, either as required courses or as electives. Studying solfege may be regarded as a lateral groundwork for music education, with each individual major comprising columns built on the groundwork. With a perennial emphasis on the importance of solfege classes for undergraduates involved in the study of any aspect of music, the program has evolved in various ways that give it an approach unique to Tokyo Geijutsu Daigaku. The concepts underlying the Solfege Course involve refining the solfege skills learned by each student in the undergraduate years. The approach is broad, going beyond the ordinary scope of solfege education to encompass listening skills and rhythm sensitivity, the capacity to hear music internally, and all aspects of music theory. It also emphasizes the skills needed to have a good command of music. The program seeks to train students to become musicians capable of understanding a diverse range of musical forms, with broad-ranging perspectives on other cultures and their own. (1) Students must have the ability to proactively use both theory and practice as the basic principle(s) based on deep insights and maintain the ability to think flexibly about all issues related to solfege. (2) Students should possess the fundamental knowledge to support the study of solfege as researchers and specialists having sufficient musical sensibilities, and a comprehensive perspective including flexible intelligence, the ability to think logically, and language capabilities. (1)Students must present outstanding research results and have the ability to contribute to the development of solfege and solfege education. (2)Students must be capable of appropriately engaging in comprehensive educational activities from a broad perspective; they must have the ability to present their research results both within and outside the university, from an international perspective, as researchers and musicians who have acquired the advanced knowledge and research capabilities that are thought-provoking and creative. The program confers both undergraduate and graduate (master’s and doctoral degrees) degrees, and it gives heartfelt consideration to how best to enable students to develop their own individuality and personality in a way that ensures well-balanced musical abilities. Undergraduate solfege classes are provided at two levels – basic and advanced – to meet differing student needs. This approach allows us to offer a more enhanced solfege program capable of instilling specialized skills, avoiding unnecessary duplication of basic content students have already learned. The basic topic is divided into three levels: beginning, intermediate, and advanced. At the beginning level, an educational program is offered for students wishing to acquire teaching credentials. Classes of 12-17 students progress through the entire range of subjects, from beginning to advanced. While the class is based on the four foundations of listening, physical sensation (rhythm), vision (speed reading), and perception (theory), the specific nature of coursework for each of these foundations is left to the discretion of each instructor. The program applies a uniform framework whereby all students take the same final exam upon completing the course. 9. Instrumental solfege: instrumental solfege, practice, and theory of note values, pitch, phrasing, etc. Solfege education must be broad enough to respond fully to trends in musical activities in society – not just in Japan but around the world, as a fundamental musical technique. Each individual musician is required to learn a broad range of basic skills and to acquire a general musical background, including knowledge of the various types of chamber music, recitals on various instruments, orchestras without conductors, and revitalizing movements in contemporary music, all of which have emerged since the 1970s. This program covers not just solfege content suited to such trends, but broad-ranging historical knowledge in a unique approach to classical and contemporary musical solfege. 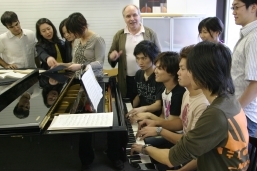 In addition, classes offered include piano sight playing for students in the first year of the Piano Course, score reading for students in the Composition and Conducting Departments, solfege for students studying in the Traditional Japanese Music Department, and solfege for students studying in the Musical Creativity and the Environment Department. Solfege classes in the master’s degree program require students to develop a sensitivity to musical works and the capacity to understand such works. In addition, the program, considered a place to put into practice the results of undergraduate solfege education, studies the nature of solfege itself and solfege education in order to train individuals capable of serving as instructors with an advanced understanding of solfege, scholars capable of interdisciplinary research, and performers capable of performing music in ways comprising both theory and practical techniques. 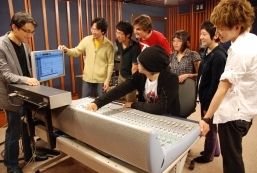 Student goals for study and future opportunities are diverse; numerous program graduates have found success across a wide range of fields, serving as instructors at a variety of universities and secondary schools for music students, including the Kunitachi College of Music, the Toho Gakuen School of Music, the Senzoku Gakuen College of Music, and other institutions. Others have gone on to become accompanying pianists active in Japan and around the world, and opera répétiteurs. The doctoral program broadens the fields of study of each student based on the knowledge and understanding gained in the master’s degree program, encouraging a more in-depth approach to music research based on advanced training. Established as a graduate course in 2000, Applied Musicology has been active in relatively new fields of music researches, such as music managing, music therapy, soundscape, and so on. In these subjects it’s very important to have practical knowledge as well as theoretical one, and musical skills and knowledge are basic requirements in order to pursue a spiritually affluent society. To fulfill this aim we ought not to be contented with fixed definitions, but we have to make a new commitment, a new participation, a kind of social engagement, by using music, applying musical knowledge and skills in the real world. Being an invisible and ephemeral phenomenon, music could easily escape us in our noisy everyday life, where we are becoming more and more insensitive to music, not to say sound itself, and we tend to abandon unconsciously these peaceful moments in music, with music. Nevertheless, music can certainly enrich our lives, soothe our minds and improve our environments. To make better use of music we do researches on the possibilities of music from a wide range of viewpoints. The main areas covered by our research program are music management, music therapy, and music culture studies. Since the foundation numerous students have earned their master’s and doctoral degrees with their laborious theses on topics such as managing orchestras, opera foundations and public music halls; music therapy for school children and the elderly; soundscapes and film scores. Some of the alumni are now working in major companies and foundations, including Suntory Hall, Biwako Hall, Japan Broadcasting Corporation (NHK), Yamaha Corporation, the Bank of Tokyo Mitsubishi UFJ, Ltd., The Kanagawa Shimbun Company, and the Japan Foundation. The others are also active as full-time or part-time staff members at various educational institutions, including Mukogawa Women’s University, the Hokkaido University of Education, the Showa University of Music, Hosei University, Rissho University, and Tokyo Geijutsu Daigaku. The faculty staff consists of three full professors (PhD), one visiting professor and a wide range of experts who are playing a leading role in different specialities. The students are required to broaden their knowledge and perspectives of their own issues by taking part in various seminars, exercises, lectures, and practical training. The Applied Musicology curriculum advocates the practice of “Living Music,” and it fosters students who apply the knowledge and techniques of music in a society amidst increasing individualization and advanced functionality, and who think about applying these skills to the creation and development of culture. 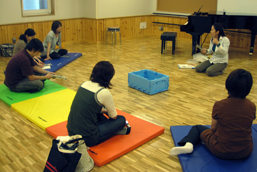 Specifically, the curriculum aims to cultivate individuals who conduct the planning and management (art management) of musicology facilities and music art organizations, those who work with various government and local organizations and related institutions for the dissemination and promotion of musicology and for the conservation and inheritance of traditional music art, those who perform music therapy in various rehabilitation facilities, and others who are engaged in the widespread promotion and dissemination of musicology. Furthermore, the doctoral program nurtures researchers engaged in educational research in each of these various fields in the university or research institutions. Once students have been enrolled for the stipulated period, have studied the required subject classes and obtained the credits essential for completion, and passed the review of the Master’s thesis, they are awarded the Master’s degree. Similarly, individuals who have passed the review of the doctoral thesis are awarded the doctoral degree. Degree conferment is evaluated from the perspective(s) of the student’s level of achievement based on the abovementioned educational philosophy of this department. While the three full professors and a guest professor are to provide guidance and mentoring to students, a set of invited lecturers furnish them with practical skills and techniques of specific areas, including music management, music copyright, stage production, music therapy, psychiatry, soundscape, and music for dance performances, etc. Each student carries out researches based on his or herresearch program under the supervision of full professors. Thirty-eight credits are required to complete the programand with the thesis accepted, students are to earn a master’s degree (in music). The students’ ultimate goal is to complete a doctoral dissertation under the supervision of a joint supervision of full professors and advisors. Students whose doctoral dissertations are accepted are granted the doctorate (PhD). Other information This course has welcomed international students. To date, the program has accepted four students from China, another four from South Korea, and one from Belgium. Some of these them, having completed the program, are now faculty members at universities in Japan or in their home countries. For the Literature in Music Course, the master’s degree program was established in 2003 and the doctoral program in 2005. At the end of the 2007 academic year, the program graduated its first PhD student. The program seeks to identify relationships between music and language through the study of musical works that feature words. Specifically, it examines the ties between music and words in genres such as opera, art song, musicals, Noh songs, kabuki, and joruri, exploring the background of each genre. The program requires analysis of the structures of lyrics and verses based on a familiarity with poetics, prosody, rhetoric, philology, and bibliography, taking an approach based on the history of music and culture and addressing works within cultural and social contexts, looking at the framework of the texts in addition to pursuing in-depth studies of the intrinsic properties of works through the approach of analytical interpretation. Master: 1. The curriculum includes exercises focusing on literature in music and special research in music literature designed with the aim to enable students to acquire knowledge and techniques related to their specialized domains. 2. The exercises focusing on literature in music enable specific guidance to be conducted related to the writing of the Master’s thesis. 3. To enhance communication and presentation skills related to the research, and also to enable the acquisition of knowledge and comprehension skills related to a broad range of comprehensive Musicology and Music Studies, the curriculum includes general seminars in which both the full-time faculty and students can participate. 4. The curriculum promotes the study of subjects and courses from other departments to nurture knowledge and techniques required for a Master’s thesis. Doctor: 1. The curriculum includes specialized subjects for the doctoral research and specialized guidance in the research area for writing the doctoral dissertation. The goal is to foster researchers with specialized and advanced knowledge and techniques related to the study of literature in music and who possess a wide range of literary insights. 2. Doctoral special research concerning literature in music facilitates the presentation of research results in a manner suited to the doctoral program students. Master: 1. The Master’s degree is awarded once students have been enrolled for the stipulated period, have studied in the subject classes established in keeping with the educational and research philosophy of the research department, have obtained the credits required for completion, and have passed the review of the Master’s thesis. 2．The result of the course completion should be the acquisition of advanced specialization and sufficient research skills, including a broad range of profound knowledge related to the specialized domain of literature in music. Doctor: 1. The doctoral degree is awarded once the students have received research guidance that is in keeping with the philosophy and goals of the research department, have studied the required subjects, have obtained more than the standard credits required, have passed the doctoral dissertation review and the examination within the stipulated time period, and have completed the program. 2. The criteria for course completion includes the ability to conduct independent activities as researchers, and the acquisition of knowledge and skills required to engage in advanced and specialized work. Requirements for the master’s degree program include practices and seminars focusing on literature in music, as well as general seminars. One of the five instructors employed by the program full-time or concurrently with other positions provides guidance to each student based on his or her research theme, in accordance with the instructor’s area of specialization. This guidance covers learning practical techniques and preparation of the master’s thesis. Required seminars are taught by the guidance instructor or by other faculty assigned by the instructor. Together with this guidance in specific areas, a program of general seminars is required to develop a broad perspective transcending conventional disciplinary boundaries. This program serves as an opportunity for discussions on a shared theme, with all instructors and all students taking part. In this way, each student receives guidance through a structure in which all program faculty participate. Elective subjects are intended to enable students to broaden and deepen research in multifaceted and multilayered ways: through other exercises focusing on literature in music, special research in literature in music, and special lectures on source literature (all by full-time faculty or faculty concurrently holding other positions and part-time instructors), as well as classes from other courses and fields. The primary goal of the doctoral program is to help prepare students to acquire the skills and perspective needed to produce groundbreaking doctoral theses in this cross-disciplinary field. In pursuing their research, students meet with several faculty advisers, including a primary advisor and various secondary advisers. Enrollment is required for only two courses: a special class on an advanced topic taught by the primary advisor and a presentation of the student’s own doctoral-level research. This program welcomes students with a strong interest in the arts and art forms involving both music and language, regardless of experience with musical performance. Prerequisites include superior language skills for reading and understanding texts in Japanese or foreign languages and general historical knowledge, including music history, as foundations for research activity. Students are expected to build daily on their body of knowledge in preparation to become working scholars, as well as to hone analytical and writing skills. Shochiku, Ibaraki Shimbun, Ikubundo; writers and directors (including the winner of the new dramatist’s prize from the Japan Playwrights Association); scholars, instructors, and critics active in the field of music in literature; individuals employed in media and companies related to arts, particularly music and performing arts. Master: Educational courses and subject classes related to both the theory and practice of music and sound have been established (including creative techniques of various media, recording techniques, acoustic psychology, and acoustic space) to nurture an advanced and broad range of knowledge and abilities required for creativity, expression, and research in music and sound. Doctor: Educational courses and subject classes have been planned to nurture high level of skills and profound knowledge required to conduct independent and creative research activities (including superior skills and knowledge related to music and sound), with individual guidance through research guidance seminars as the core. After gaining a basic familiarity with musical and audio knowledge and skills, students use these to focus on advanced research themes, including the creation of a broad range of cross-disciplinary work (music and audio works incorporating video, stage art and other forms of physical expression, including those presented in other media) or use of recording technologies to create surround-sound works. Students completing studies in this field are expected to be active across a wide range of fields as audio specialists involved in areas including not just audio and music production, but various other media, businesses, and research and educational institutions. Creativity of Arts and the Environment, a research field established in 2006, uses a multifaceted approach to examine links between society and various modes of artistic expression, including music, stage art, film and video, and works presented via alternative media. Inheriting the perspectives of the Department of Musical Creativity and the Environment, from which this program is derived, this program provides students with more in-depth knowledge and skills in broad-ranging artistic expression, the social context for art, and general culture, with the goal of training individuals capable of contributing to the evolution of new art forms for the 21st century and to the environments in which these works will flourish. Master: Once the students have acquired profound knowledge related to music and sound through the subject classes established as a part of the curriculum, a thesis review of the Master’s thesis that constitutes the research results is conducted. Students who pass the thesis review are awarded the Master’s degree. It is required that the thesis has a clear purpose, subject of investigation, and methodology (including originality of research, development of the argument, and language expression). Furthermore, for research that places importance on practice, the Master’s thesis is required to be accompanied by a creative work. Doctor: For the degree review, it is required that students have received the research guidance provided by the faculty members and have studied the subjects in accordance with the guidance received. They must have acquired the knowledge and advanced skills to conduct independent, creative research activities and have submitted the doctoral dissertation. The dissertation is reviewed on the basis of criteria such as clarity and relevance of purpose, the subject and methodology of investigation, contribution to the field of study, the high level of originality, the clarity of language expression, and the consistency of development of the argument. Once the student is judged as having passed, the doctoral degree is awarded. Master: Once the students have acquired profound knowledge related to art management, performing arts, and cultural studies through the examination of subject classes established as a part of the curriculum, a thesis review of the Master’s thesis, which constitutes the research results, is conducted. Students who pass the thesis review are awarded the Master’s degree. It is required that the thesis demonstrate a clarity of purpose, subject and methodology of investigation, have research originality, clarity of development of argument, and language expression. Furthermore, for research which places importance on practice, the Master’s thesis is allowed to be accompanied by a creative work. Doctor: For the dissertation review, it is required that students have received the research guidance provided by the faculty members and have studied subjects in accordance with the guidance received. They are expected to have acquired extensive knowledge and advanced skills required to conduct independent, creative, research activities, and have submitted the doctoral dissertation. The dissertation is reviewed on the basis of criteria such as clarity and relevance of the purpose, the subject and methodology of investigation, contribution to the field of study, high level of originality, clarity of language expression, and consistency of development of argument. Once the student is judged as having passed, the doctoral degree is awarded. Instruction and learning proceed according to various formats, based on various practical methods of training, including: creating works; planning and operating cultural events; and investigation and research into a wide range of cultural phenomena. Specific areas examined range from cultural policy and arts management and the programming of theaters, festivals, and other programs to theories of drama and choreography; from the study of the actual management of culture and arts to the social context in which these activities occur; from studies of cultural theory to media and communication theory, popular culture, and considerations of the relationship between arts and culture and society at large based on participatory fieldwork. This program produces graduates who, as individuals possessing profound cultural knowledge, go on to take active roles in various media, related companies, and research and educational institutions, as well as specialists involved in project planning and management across a wide range of artistic fields.